By Anonymous | March 13, 2011 - 13:30 | Posted in AnonyNews | 1 Comment | Post is random. I was like Adam when he was first created. OpLibya Recognizes The Libyan NTTC. By Doemela | March 28, 2011 - 22:44 | Posted in AnonyNews | Comments Off on OpLibya Recognizes The Libyan NTTC. #OperationPayback Next Traget : Warnerbrosrecords.com ! By Anonymous | March 28, 2011 - 22:31 | Posted in AnonyNews | Comments Off on #OperationPayback Next Traget : Warnerbrosrecords.com ! Limewire has been sued for 75 TRILLION Dollars by 13 record companies. It was removed for featuring calls for violence, a company spokesman said. Israel had raised concerns about the page. Facebook has helped spread calls for protests in Arab states. 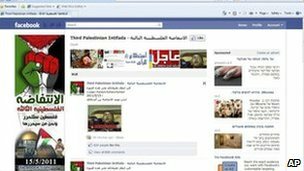 The Third Palestinian Intifada page had called for an uprising after Muslim prayers on Friday 15 May. In Greece, the government has little more to offer. By Doemela | March 29, 2011 - 15:11 | Posted in CyberGuerrilla | Comments Off on In Greece, the government has little more to offer. In Greece there is a noticeable rise of anarchists. Coverage unfortunately characterized by many misunderstandings. Some of the anarchists use violence and therefore, like all anarchists as violent put down. The anarchists are anti-democratic and therefore they are the personification of evil. They recognize the Greek government no longer legitimate, and that for many people difficult to understand. Because of the parallels with other European countries, the situation in Greece very interesting. Therefore, it is a good thing to try to dive into the backgrounds of anarchism.